All roads may lead to Rome, but once you get there, good luck taking the subway. The sprawling metropolis is expanding its mass transit system — a sluggish process made even slower as workers keep running into buried ancient ruins. “I found some gold rings. I found glasswork laminated in gold depicting a Roman god, some amphoras,” says Gilberto Pagani, a bulldozer operator at the Amba Aradam metro stop, currently under construction not far from the Colosseum. Pagani is part of an archaeological team at the site, a certified archaeological construction worker trained to excavate, preserve and build in cities like Rome, with thousands of years of civilization buried beneath the surface. The presence of ancient artifacts underground is a daunting challenge for urban developers. For archaeologists, it’s the opportunity of a lifetime. At roughly 40 feet below the surface, her team, which began work in 2013 at this stop, has uncovered a dwelling that once belonged to the commander of an adjacent military barracks. It dates back to the reign of the emperor Hadrian in the 2nd century A.D.
As two archaeologists dust mosaic flooring with tiny, precision brushes, idling industrial machinery belches diesel exhaust just a few feet away. Construction workers routinely have to shut the machinery down when a discovery is made. The new route, the C line, was supposed to be ready in time for the Roman Catholic Church’s Year of Jubilee — back in 2000. But city planners and officials can’t blame all the delays on the ancients. There are ongoing investigations into waste and runaway spending by modern-day contractors and governments. The city inaugurated its newest metro station, San Giovanni, in May. It is an important link that, for the first time, connects the C line to the city’s two other subway lines. The C line is also the most technologically advanced, the only one in Rome to be fully automated, with no conductors. As a train whooshes into the station, commuter Luigi Bonatesta jumps aboard. He says the wait for the station to open was frustrating. 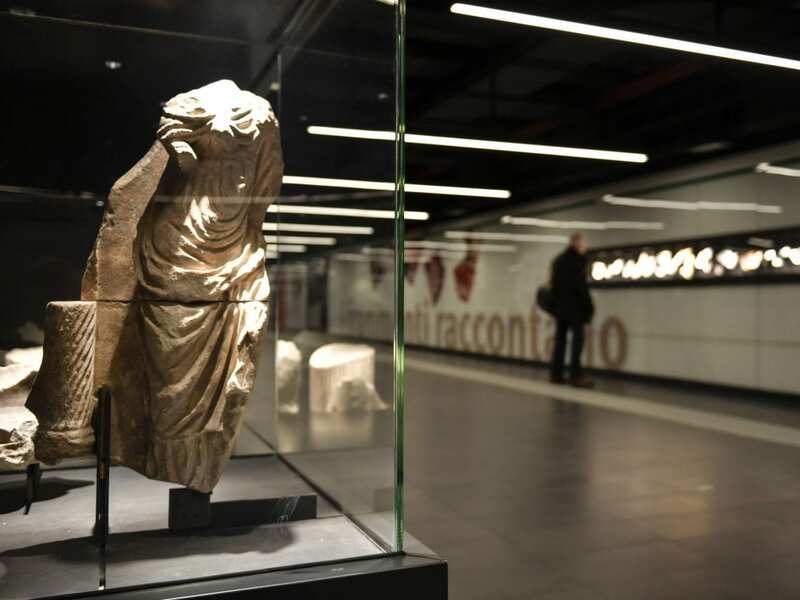 One reason for the holdup was a surprise addition: inside the San Giovanni station, the walls are lined with artifacts discovered during the subway’s construction, including stone bathtubs, marble busts, and even ancient peach pits from a Roman fruit vendor, all visible for the $1.75 cost of a metro ticket. The next stop on the line will be Amba Aradam, the site of the ancient Roman military barracks, where archaeologists are still digging. Morretta says commuters there will be in for an even bigger treat. She hopes that will make it more enjoyable for people to wait for a train. But first, commuters will have to wait for the stop to be finished, with excavating still underway and an expected opening at least four years off. For a city that wasn’t built in a day, its subway system certainly won’t be, either.